It adopts H.264 Main Profile@ Level 3.0 compression format, support 2 way audio, Wifi, SD Slot (32GB), and mobile phone view, built-in Pan/Tilt and IR, alarm in and out interface, support UPNP, motion detection, email alarm, etc. It is the real all in one ip camera. - Built-in microphone, and also support to connect external audio capturing device (like MIC phone or sound pick-up) to capture the audio. External speaker can play the voice sent to the live scene, to achieve two-way intercom function. Audio support G.711 and G.726 types. Support echo suppression. - Built-in Pan/Tilt, horizontally 350°, vertically 100°. - Infrared LED for night vision covers 5m area, to realize 24 hours monitoring. - Support maxim 32G SD card for video and picture storage. - Support 802.11b/g/n protocol, can build up wireless monitoring. - Manufacture attached a label at the bottom of each IP Camera, it include Device ID, DDNS. 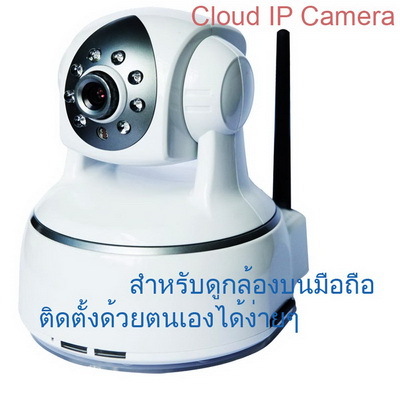 When IP Camera is connected to the internet, this URL can be used to visit the device.